In: Proceedings of ELECO 2017. International Conference on Electrical and Electronics Engineering (ELECO-2017) November 29-December 2 Bursa Turkey ISBN 978-1-5386-1723-6 IEEE Xplore 1/2018. In: Proceedings of the HRI conference. ACM/IEEE International Conference on Human-Robot Interaction (HRI) March 6-9 Vienna Austria ACM/IEEE 2017. In: Hubert Borgmann (Hrsg.). 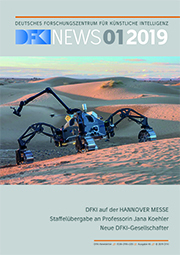 Proceedings der Actuator 2012. International Conference on New Actuators (ACTUATOR-12) June 18-20 Bremen Germany Seiten 295-298 ISBN 978-3-933339-19-5 WFB die Wirtschaftsförderung Bremen Bremen 6/2012. In: Andrade Cetto Juan Ferrier, Jean-Louis, Filipe Joaquim (Hrsg.). Informatics in Control, Automation and Robotics. Seiten 239-253 Lecture Notes in Electrical Engineering (LNEE) 89 ISBN 978-3-642-19538-9 Springer 2011. In: Proceedings of 7th International Conference on Informatics in Control, Automation and Robotics. International Conference on Informatics in Control, Automation and Robotics (ICINCO-2010) June 15-18 Madeira Portugal 6/2010.